If you ask ten people what food Washington, DC is famous for you are likely to get ten different answers. Our nation’s capital has a number of landmark restaurants like Ben’s Chilly Bowl and Clyde’s, but on a recent stay in Georgetown I was struck by the number of hometown pizzerias. Inspired by visits to Pizzeria Paradiso and Paolo’s Ristorante I decided to select pizza as the food Washington, DC is famous for and make my own version of Quattro Formaggio. I began by roasting several cloves of garlic. To do this I cut the tops off the cloves of garlic, drizzled olive oil over the cloves, wrapped it in foil and baked it in the toaster oven for 30 minutes. When that was finished I mashed the garlic with a fork and spread it on the dough. Next, I sprinkled on fresh mozzarella, Fontina, Gorgonzola and Pecorino cheeses. The pizza baked for 10 minutes and the cheeses turned beautiful golden color. The rich flavors of the cheeses along with the milder flavor of the roasted garlic tasted fantastic together. 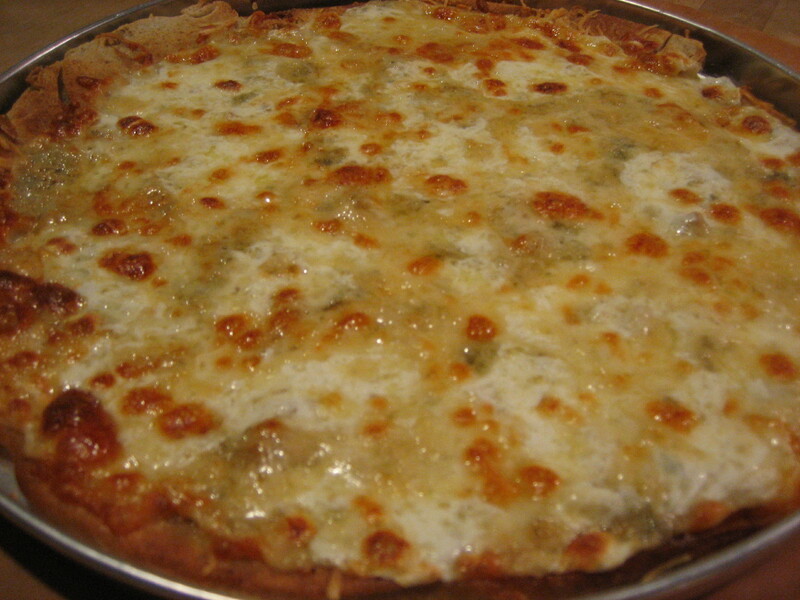 My Quattro Formaggio pizza recipe was a savory dish! This entry was posted in cheese, fontina cheese, garlic, Gorganzola, herbs, mozzarella, Pecorino and tagged cheese, DC, garlic pizza, Quattro Formaggio, Washington. Bookmark the permalink. And I need to learn not to blog about them when I am hungry! It was delish!